The Parliament Privileges and Ethics Committee has commenced an inquiry into the alleged misconduct of Joint Opposition MPs Wimal Weerawansa and Prasanna Ranaweera in Parliament on July 3. 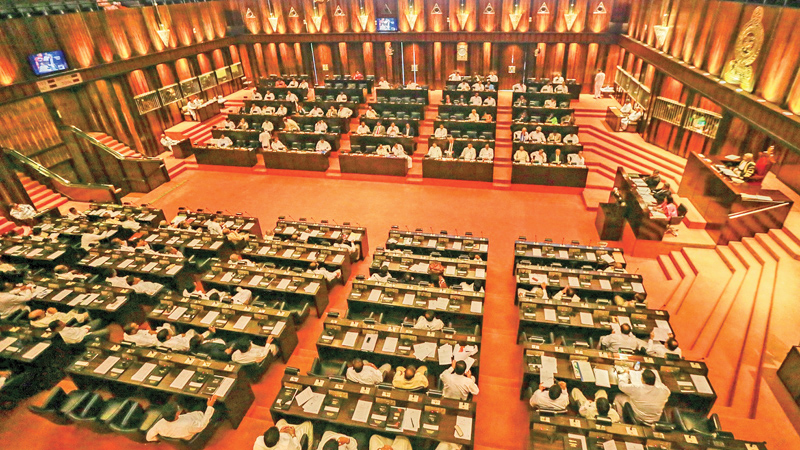 A formal complaint into the incident was made in the House by Deputy Minister Ajith P. Perera on July 4 and it was referred to the Parliament Privileges and Ethics Committee the next day. Deputy Minister Perera brought to the attention of the House that the two JO MPs with their foul language and aggressive behaviour even threatened the Chair and tried to grab the Mace. They ridiculed Parliament and that it amounts to a breach of privileges of all other MPs. He urged that a comprehensive inquiry be held into the incident and tough action taken against the two MPs as per the provisions contained in the newly adopted Standing Orders and Code of Conduct for MPs. Parliament sources said the Committee which met last Thursday following the complaint, perused the CCTV footage of the incident. Ministers Thilak Marapana, Ranjith Madduma Bandara, Gayantha Karunathilake and UPFA MP Susil Premajayantha had attended the Privileges and Ethics Committee meeting at the Parliament complex. Speaker Karu Jayasuriya also previously expressed his deep displeasure over the unruly behaviour of MPs Weerawansa and Ranaweera in the House.